People say that to take screenshot on Android 4.0 and up, by default, just press and hod the Power button + Volume Down but it doesn’t work on Galaxy Tab P1000. 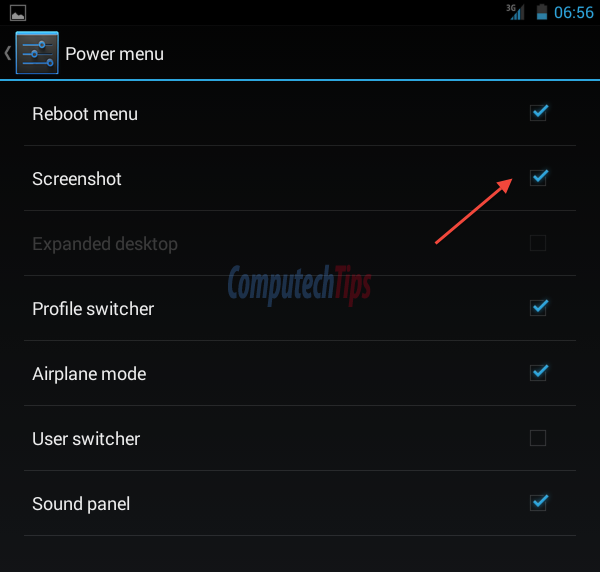 On CyanogenMod 10.2 which is based-on Android 4.3, take screenshot is much easier by pressing and holding the Power button. You need to enable it. Go to ‘Settings > Buttons > Power menu‘ then enable the Screenshot feature. Now go to the screen that you would like to take screenshot, press and hold the Power button. See the demo video below! Hey, thanks alot for the tip. Is there a way to avoid getting the power options menu by capturing the screen by pressing “power+home” or something, instead? I have tried that but it doesn’t work on GTab P1000. However, I prefer to press a single button rather than two or more buttons. It’s much simpler this way. Beauty! I wasn’t so sure about this ROM when I first installed it, but as I learn more and more about it, I’m quickly becoming a fan.